In their final regular season match, Bryant’s boys and girls golf teams earned wins in dual matches with North Little Rock on Tuesday afternoon at Hurricane Country Club. The Hornets’ Clayton Harbour and Logan McDonald tied for individual medalist honors over nine holes with rounds of 36. North Little Rock’s Hunter Walker was a stroke behind at 37. 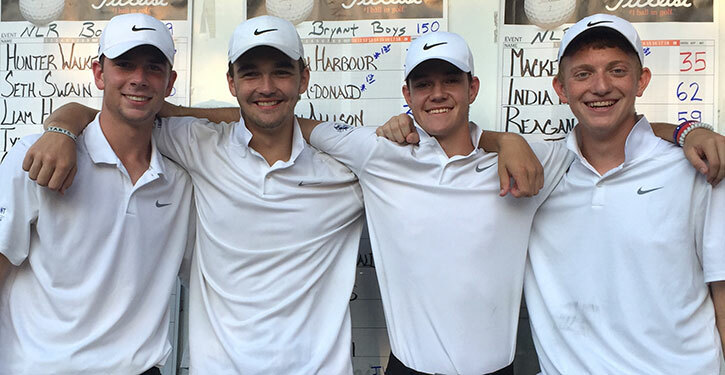 It was the final home match for seniors Landon Allison, Brendon Morton, Harbour and Caleb Barnes. Allison and Daniel Taylor each carded a 39 with Morton finishing at 41 and Andrew Gaspard shooting a 48. The Bryant boys scoring group won 150 to 159. North Little Rock’s Mackenzie Lee earned medalist honors among the girls with a round of 35. But the Lady Hornets, led by Caitlin LaCerra’s 45, combined to win the team competition, 151-156. Brooklyn Waller shot a 51, Leighton Crawley carded a 55 and Meredith Medford finished at 59. Anna Barnes turned in a 64. “Not our best day with the girls but we’re able to pick up the victory,” Griffith noted. “Today wraps up the JV season,” he added. “I’m hopeful they will spend a lot of time on the practice grounds over the next year and be ready to step up and replace our seniors. “Our varsity boys and girls will be hitting the practice links over the next few days getting ready for State,” the coach concluded. The girls State tournament is set for Sept. 24-26 at Rogers. The boys State tourney will be held at Cabot on Oct. 1-3. The first day will be a practice round with the conference championship determined on day two along with qualifying for State, which will be played out on day three.